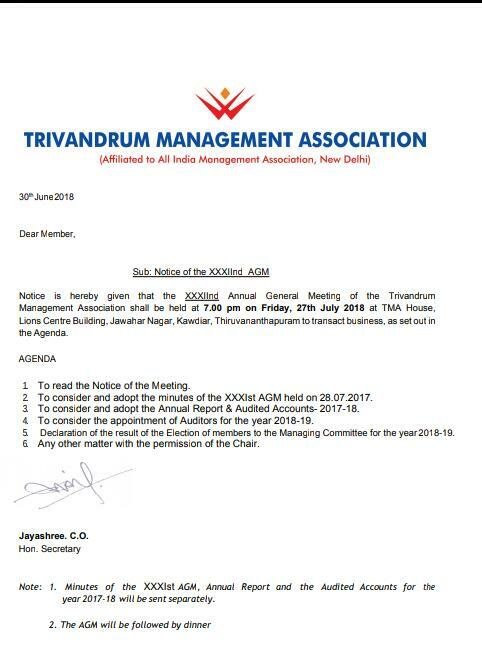 Annual General Meeting of Trivandrum Management Association shall be held at 7.00 pm on Friday, 27th July 2018 at TMA House, Lions Centre Building, Jawahar Nagar, Kawdiar, Thiruvananthapuram to transact business, as set out in the Agenda. 2. To consider and adopt the minutes of the XXXIst AGM held on 28.07.2017. 3. To consider and adopt the Annual Report & Audited Accounts 2017-18. 4. To consider the appointment of Auditors for the 2018-19. 5. Declaration of the result of the Election of members to the Managing Committee for the year 2018-19. 6. Any other matter with the permission of the Chair.